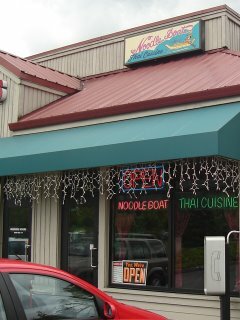 Noodle Boat is a Thai restaurant in Issaquah, about 15 minutes east of Seattle downtown. I was in the area for business so I decided to drop in and check out their noodle soup: "Noodle Boat". The dish is a noodle soup variety from the city of Ayutthaya located north of Bankok. 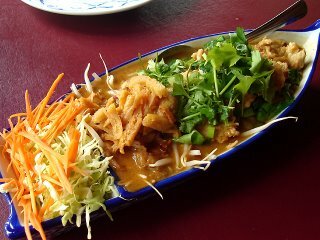 This dish is called "Guay teaw reau Ayutthaya" which translates to Ayutthaya style boat noodle. 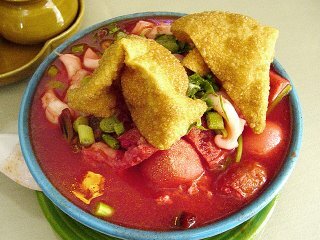 The Soup - is a thick and richly flavored hot and sour soup. Imagine a tom yun kun soup just more sour, saltier and with even more intense flavors of the spices... then add a hint of curry and/or peanut sauce. To tell you the truth, I wasn't able to figure out the exact ingredients of this soup, all I can say was that I wish the dish came in a bigger bowl because I wished there was more. The Noodles - are the Chantoboon noodles that you see in pad thai. This flat rice noodles that start out rather soft and can turn soggy real quick if over cooked or left in the soup for too long. The noodles are a great match with the soup but were a challenge to eat since it was buried underneath of lots of vegetables and toppings. The Toppings - included your choice of meat, deep fried tofu, green onions, coriander, bean sprouts, and raw cabbage and carrots served on the side like a salad. All the toppings were great with the noodle and soup, but there was so much of it that I wish the bowl was bigger for me to organize them. I ended up eating most of the toppings first just to work my way to the noodles underneath. Overall - a great Thai style ramen that I will be coming back for more. Issaquah might be too far for you to come just for a bowl of Thai noodles, but most Thai restaraunts in the Seattle area serve some type of noodles soup. Look for tom yun kun noodle soup in other places, which can taste quite similar to this dish. Yamaoka is a relative new comer to the Sapporo ramen scene that started its first store back in 1992. 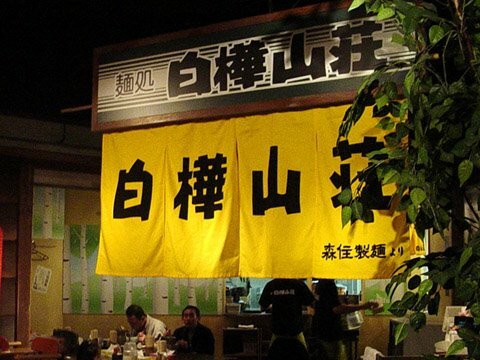 This is actually a large ramen chain store that started in Ibaraki prefecture closer to Tokyo, but the owner had a long admiration for Sapporo style ramen and wanted to test his creation in one of the oldest ramen markets in Japan. 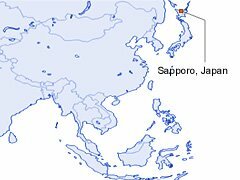 I figured if he wanted to survive in Sapporo he better have a good 味噌ラーメン (Miso ramen), which is what I ordered. The Soup - was a thick and rich tonkotsu based soup that had none of the strong pork bone smell. The miso they used looked like a white miso paste that tasted quite mild. They use red miso paste for the 辛味噌ラーメン (spicy miso ramen), which is deep red in color from the miso and the tons of red chili powder is uses. There was a layer of oil on the soup to keep the heat of the soup, just like other Sapporo ramen, the soup was so hot it burnt your tongue. The Noodles - are very nice, these thick, curly ramen noodles that are cooked firm and are springy and chewy. Ofcourse the ramen here took a long time to cook and I had to wait quite a bit. The Toppings - were simple, a slice of cha-shu roasted pork, some boiled green vegetables, 3 big sheets of nori dried seaweed and a sprinkle of sesame seeds. The roasted pork was so-so, but the seaweed was a nice match to the soup. Overall - a richer, oilier, less refined version of Sapporo ramen, perfect for those cold winter nights before you head home after work or school. If you were to be very picky you could say this isn't even real authentic Sapporo style ramen. The tonkotsu flavor dominated soup is not the standard in Sapporo, but this ramen has gotten so popular that it now has many chain stores in the area. There is even one in Tokyo if you don't want to go all the way north. 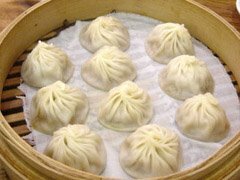 Din Tai Fung is famous for its Chinese pork dumplings called ShiaoLongBao, during my last visit to Shanghai my co-workers and I ate about 100 of these dumplings. 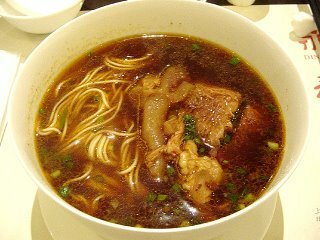 Even with all those dumplings I was still able to find some room to try their noodle dish 原汁紅焼牛肉麺 (Beef noodle soup). 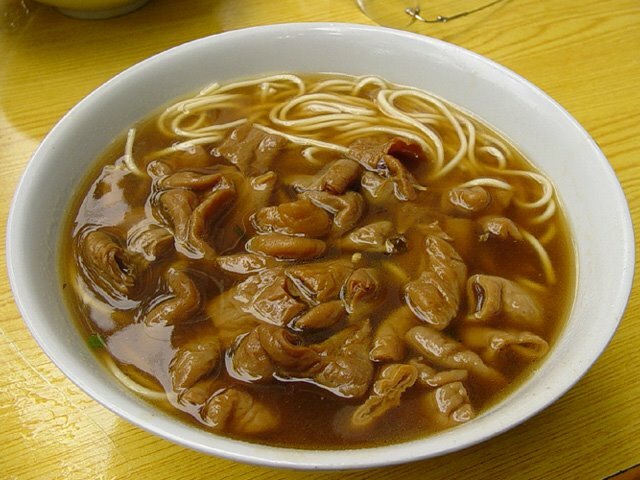 The Soup - is a soy sauce flavored beef broth that is very pure and simple. A can taste a trace of some ginger, garlic and star anise, but otherwise contrary to its appearance, this is a very light soup. 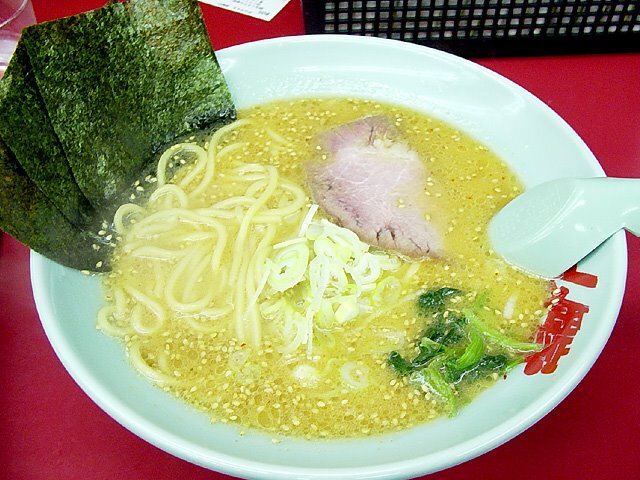 The Noodles - are thin, straight noodles cooked firm, very similar to the Kyushu style tonkotsu ramen noodles. The firm noodles have a strong presence, maybe a bit too much for the light delicate soup. The Toppings - are some pieces of cooked beef, beef tendon and green onions. The tendons are cooked vey tender, almost melting in your mouth. The pieces of beef are not as tendor and a little dissapointing. Overall - a sophisticated beef noodle soup that is light and delicious, though I think this dish might be catered more to the preference of foreigners rather than the locals. Beef noodle soup should filled with intense flavors of Chinese herbs and other spices, Ding Tai Fung's version is just a little too reserved for my taste. 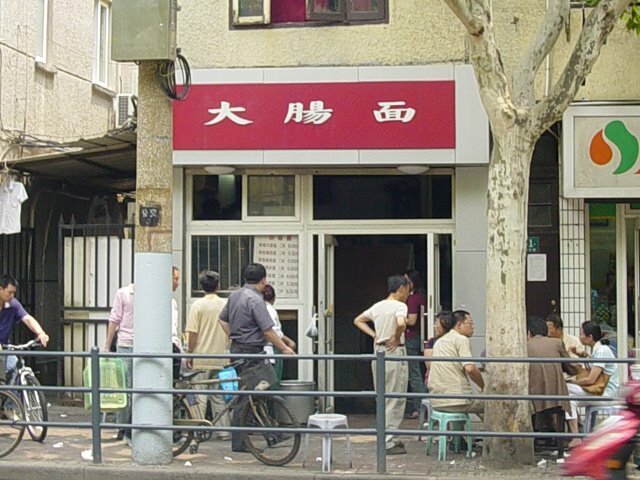 But then, not a lot of people would go to Ding Tai Fung to order beef noodle soup, I would recommend you try the pork dumplings along with the dozens of different types of dumplings they have before trying the noodles here. Thai Kitchen has been around the Seattle East side area for 25 years, while I've visited them numerous times for their curry and and Rainbow yum yum, here I am only interested in their noodle dish - Yen Ta Fo. The Soup - is shocking pink! Compare this to the Yentafo noodle I had at Noodle House, the Yen Ta Fo at Thai Kitchen looks more like a modern museum art piece than something edible. The flavor of the soup is as intense as its appearance, spicy, sour and very salty. IMO they went a little overboard with the salt and yentafo sauce. The Noodles - are the thin Chantaboon noodles used in pad thai, the noodles must have been cooking in the soup for quite a bit for it to soak up all the pink coloring, but the noodles were firm and delicious. The Toppings - spinach, fried wonton, squid balls, fried tofu, and shrimp, all pink in color and great match to the spicy and sour soup. Overall - I liked the dish overall but I feel the flavor was a little too intense for me to recommend out right. Maybe this was an anomoly and someone accidentaly spilled too much salt on this day. Ask them to take it easy on the salt and you can adjust the flavoring on your own. The thin, firm noodles were a treat and worth coming back for for ramen fans. Miso Ramen was invented in Sapporo, the largest city in the northern island of Hokkaido. 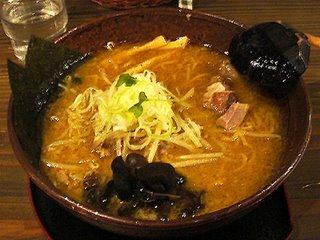 The first miso ramen appreared around the early 1960's and quickly spread all over Sapporo city. 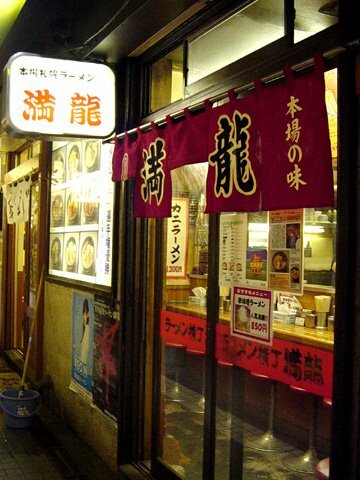 In 1967 the first Sapporo style miso ramen store was set up in Tokyo. 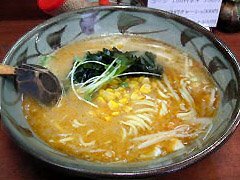 Today miso ramen is considered one of the four major types of ramen in Japan. Because if the bitter cold winters in Sapporo, the miso ramen from this area is also famous for its heat and how it warms you up from the inside. 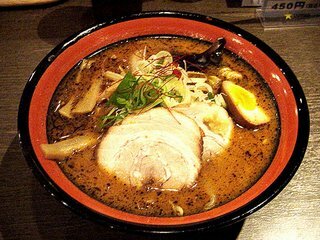 The ramen is served very hot, often with a layer of oil to preserve the hear in the soup; A healthy serving of stir fried vegetables is also standard in Sapporo style ramen. To counter balance the texture of the stir fried bean sprouts, onions and carrots, they use thicker, curly noodles that has a strong presence as well. DaChang Mian is one of the best noodles places in Shanghai, at least that's what my native Shanghai friends say so I had to give them a try. Once I was at the restaurant I knew that I had to muster up quite a bit of courage just to eat this ramen. The restaurant, to my expectation, was sanitarily challenged. The floors were sticky, garbage bags were placed right next to the tables, and the kitchen was fortunately very dark so I couldn't see what it was really like. So I ordered the most popular dish 大腸面 which literally means, "big intestine noodles", there's no need for fancy product naming in China I guess. The Soup - was simply the broth that they used to stew the meat, and intestines. The taste was very simple, a sweet soysauce flavor that was surprisingly good. Okay, after what I saw from the store I must say that my expectations were low, but the soup was a pleasant surprise. The Noodles - were straight, plain white noodles that were actually cooked very FIRM, what a surprise! 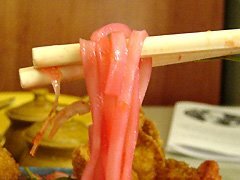 After all the years of eating soft, mushy, overcooked noodles in Chinese restaurants in the US I began to think that all Chinese noodles were like that. Guess we can only blame it on the Americanization of Chinese food on that one. The Toppings - pig intestines, and nothing else. No jokes here, they were actually really good. The sweet soysauce stew is a common flavor for stewing meat in Chinese home cooking, I've just never had it with intestines before. The toppings are cooked to just the right firmness and chewiness. Overall - try at your own risk. Actually, you know what, don't try this ramen; I would like to report that it's been 2 weeks since I tried the intestine noodle and my health is normal, but I've trained my immune system in the foodstands of Asia since I was 8 years old. I don't think I want to jeapordize your health if you've been raised in a more sanitized country. 辣肉面 (spicy meat noodle) that I will definitely try if I ever come near this area again. Manryu is one of the old school miso ramen stores in Sapporo, this place is famous for representing Sapporo ramen in a nation wide contest in the 90's and winning the grand prize. Today I tried one of Hokkaido's famous ramen the バターコーン味噌らーめん (butter corn miso ramen). 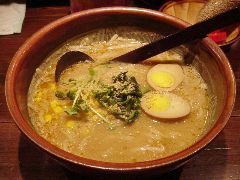 The Soup - is a blend of tonkotsu pork bone and vegetable stock, it is actually quite light compared to many of the newer, richer miso ramen. The miso flavor has quite a sweet aroma to it. The ramen is topped with a thick slice of butter (Hokkaido is famous for its milk and butter), the melted butter gradually changes the flavor of the soup to a rich creamier soup. Many people say that the butter and miso is a good match, for me it still took some getting used to. The Noodles - are regular thickness, slightly curly noodles cooked slight on the soft side. Noodles now a days mostly are on the firm side, the softer noodles are probably part of the old school formula too. The Toppings - wakame seaweed, cha-shu pork, green onions, menma bamboo and CORN! The corn is very sweet and kinda matches the sweetness of the miso soup. The rest of the toppings are average, the cha-shu pork is served cold so soak it in the hot soup before eating. Overall - I loved this miso ramen because it has quite a bit of nostalgia for me. Having read for many years about the "Butter Corn ramen" of Hokkaido, I couldn't wait to try this ramen out. The hot soup and the thick layer of melted butter is suppose to help keep people warm in the cold winter months, unfortunately it was the beginning of Summer when I visited Sapporo. I will definitely have to come here again during the winter and try this ramen in the right weather. Menya chi-chi has been around sapporo for more than 15 years, but around the year 2004 the owner came up with a new ramen called the 焦がし味噌らーめん (burnt miso ramen), that made chi-chi one of the new favorites in Sapporo. On my first trip I gave their burnt miso ramen a try. 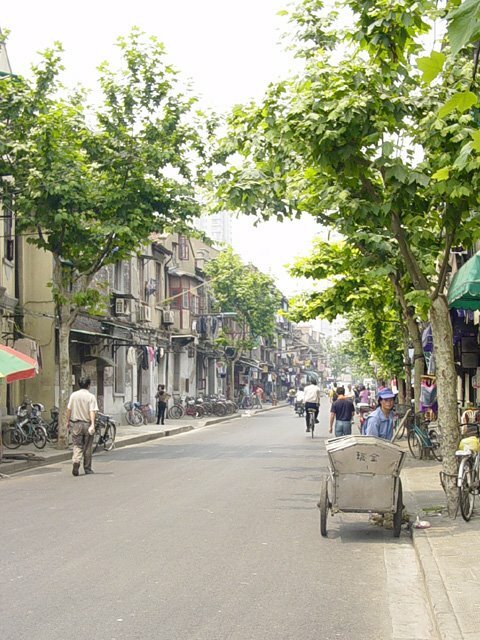 The Soup - is a pork bone, vegetable, broth based soup. The soup is topped with some black oil that gives the soup a burnt flavor that is a very nice match to the miso soup. I have had a similar ramen in Tokyo a few weeks back called Go-gyou, Chi-chi's soup is slightly lighter and has much less of the burnt black oil... slightly dissapointing since the smokey flavored soup can be so addicting. The Noodles - are regular thickness, slightly firm, slightly curly noodles. The Toppings - two slices of cha-shu pork, green onions, menma bamboo and kikurage mushrooms. The boiled egg and cha-shu pork are slightly flavored, neither of them overpowering. Like a lot of other miso ramen, the main character is the soup. Overall - a very delicious ramen where the burnt black oil adds a new twist to the miso soup. 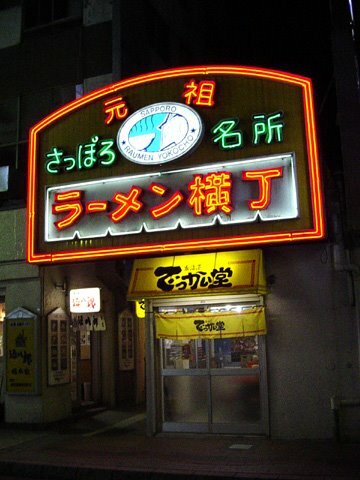 However, if you are in Sapporo and had time for only one ramen then I would recommend 白樺山荘 (Shirakaba Sansou). Chi-chi actually has 4 different miso ramen on their menu, the 白味噌、赤味噌、辛みそ、焦がし味噌、(White miso ramen, Red miso ramen, Spicy miso ramen and Burnt miso ramen). I am tempted to try the White miso ramen on my next trip, since that type of ramen soup is so rare. 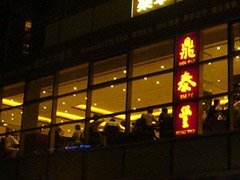 麺屋 Chichi is located in the "Sapporo Ramen Republic" which is near Sapporo station, on the 10th floor of the department store Bic Camera. 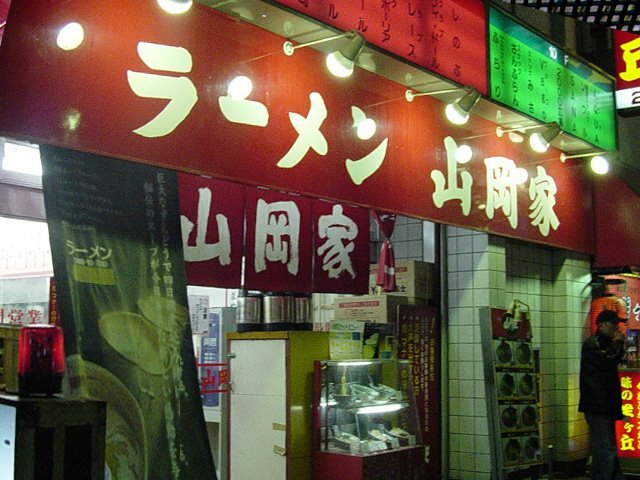 Shirakaba Sansou is a recent darling of the ramen scene in Sapporo, Hokkaido. Started 8 years ago by a Japanese salary man who decided to quit his day job and go into the ramen business, after numerous trials and errors he finally came up with the perfect balanced miso ramen that put him on the map. Needless to say, I tried the 味噌ラーメン (Miso ramen) on my first trip to this ramen store. The Soup - is HOT!!! The soup is covered with a thin layer of oil that keeps the heat, be careful not to burn your tongue. The soup is a rich broth, most likely a pork bone-seafood blend soup. But neither the flavor of the pork bone or seafood overpowers, making this a really well balanced miso flavored soup. The Noodles - are normal thickness curly noodles, cooked at regular firmness. Nothing fancy here, just good old fashion ramen noodles. The focus seems to be put on the delicious soup. The Toppings - are menma bamboo, kikurage mushroooms, green onions, nori dried seaweed and small chunks of cha-shu pork. Every topping is a good match with the soup, again, nothing fancy here that overpowers the soup. Overall - make this the first ramen you try when visiting Sapporo. 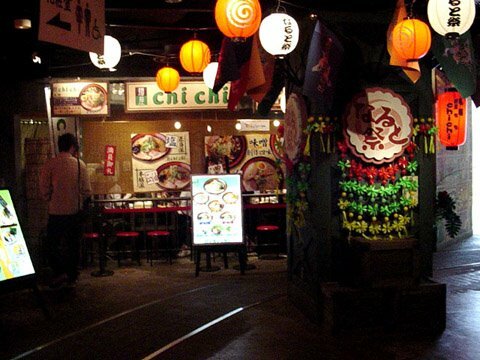 It is located right near Sapporo station in the 札幌ら～めん共和国 (Sapporo Ramen Republic). 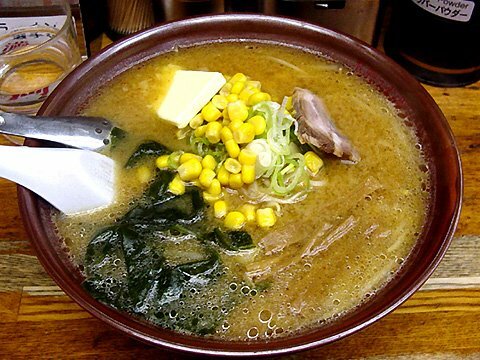 The owner of the ramen store mentions that the secret to his ramen is not the ingredients, but achieving the perfect balance between everything. I tried many miso ramen in Sapporo during my short trip there, Shirakaba definitely is the most memorable because of the well balanced soup.